Penicillin was a game changer. It ushered in a class of drugs collectively able to treat pretty much any bacterial illness. Compared to the other antibacterials available at the time of its widespread introduction, penicillin was safe to use and cheap to produce. Prior to penicillin, antibacterial drugs were mostly developed by stringing together a bunch of slightly different compounds in a laboratory and then screening them for the ability to kill or inhibit the growth of certain bacteria. Organoarsenicals (e.g. arsphenamine used to treat syphilis) and sulfa drugs (e.g. sulfanilamide used early on in WWII before penicillin took over) were the two big classes of antibacterials to be developed in this manner. Yet these synthetic drugs only started popping up in the early 20th century. Looking further into the past, there's this vast era of human existence during which people used the natural resources available to them to stem the tide of death and injury from bacterial infections. These older antibacterial agents are the topic of this post. According to my trusty old pharmacology textbook (the first edition of Goodman and Gilman's The Pharmacological Basis of Therapeutics), an old treatment for leprosy (caused by two bacteria of the genus Mycobacterium) is something called chaulmoogra oil, which is acquired from the seeds of certain Asian trees belonging to the genus Hydnocarpus. The use of this oil against leprosy was reported by Zhu Zhenheng, a Chinese physician who practiced medicine during the 14th century. It also makes an appearance in Ayurvedic medicine. By the 19th century, it was being used in Western medicine (it's now considered obsolete). Seeing as it makes you super nauseous if you swallow it, physicians instead injected the oil under the skin. The active ingredient of chaulmoogra oil is an unsaturated fatty acid appropriately named hydnocarpic acid. Unlike most fatty acids, hydnocarpic acid contains a ring of five carbon atoms at the end of the chain of carbon atoms it's otherwise made up of. Hydnocarpic acid appears to mess with the bacteria responsible for leprosy by inhibiting the activity and/or synthesis of biotin (vitamin B7), which bacteria need to reproduce. In related news, chaulmoogra oil also contains 5'-methoxyhydnocarpin. This polyphenol boosts the action of certain plant alkaloids (e.g. berberine) against bacteria (e.g. Staphylococcus aureus). In particular, it helps the alkaloids to block multidrug resistance pumps. These proteins are used by bacteria to resist the harmful effects of antibacterial substances by pumping them out of their cells. Disabling the pumps makes bacterial infections easier to treat. 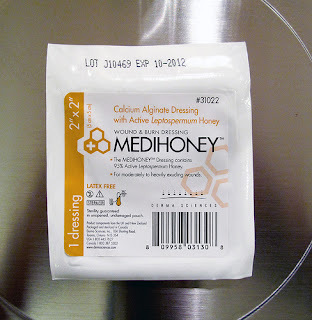 Honey has long been used to stave off the bacterial infection of wounds (due to burns, surgery, or trauma). The wound healing nature of honey is mentioned in texts from ancient Egypt (bees were considered sacred) and Greece (Hippocrates thought honey was great). Honey is particularly interesting because it appears to be active against otherwise drug-resistant bacteria and doesn't become the target of resistance itself. Its ability to prevent and limit the growth of bacteria once applied to a wound stems from four characteristics: (1) high sugar concentration (i.e. low water activity), (2) low pH, (3) slow yet steady hydrogen peroxide production (via glucose oxidase), and (4) unknown flower- or bee-derived antibacterial substances. One of the issues with using honey is the substantial variation among honeys from different natural environments with respect to their ability to kill bacteria. The solution to this has been the development of medical-grade honey manufactured by bees in closed greenhouses (i.e. under controlled conditions) to ensure a more consistent product. A 10th century English (Anglo-Saxon) medical textbook (entitled Bald’s Leechbook) recently yielded a recipe for an antibacterial ointment capable of offing MRSA, a widespread drug-resistant form of Staphylococcus aureus. Bald’s eyesalve was indicated for treating a “wen” in the eye. This is probably a reference to a sty, an infection of the eyelid typically caused by S. aureus. The recipe calls for garlic and another close garlic relative (the text isn't clear on which one, both onion and leek worked in the modern preparation). These were to be crushed, mixed with wine and ox gall (cow bile), and stored in a brass or bronze container for just over a week. Notably, all of the ingredients on their own (except the wine) are thought to have some antibacterial activity. Further, some of the copper (an excellent bacteria killer) from the container (brass and bronze are both copper alloys) likely leached into the salve during its storage. In Jordan, there's a long history of using red soils to treat skin infections. The soil is collected from beneath the surface and away from where people congregate, and applied daily as a paste or powder to the infected area. It's now known the soil contains several bacteria capable of making antibacterial compounds. To close things out, it's worth noting antibacterial use in the pre-penicillin era wasn't always intentional. If you shine a UV light on the skeletal remains of people who lived in Sudanese Nubia or near the Dakhleh Oasis in Egypt during the 4th to 6th centuries, chances are they'll produce a yellow-green glow. This is because the skeleton-wearers were exposed to tetracycline during their lives. Tetracycline is an antibacterial drug produced by certain bacteria (Streptomyces species) that likes to hang out with calcium and so ends up accumulating in bone and teeth. It appears the folks with the glowing skeletons inadvertently consumed food, probably stored grains, contaminated with tetracycline-producing bacteria. This intake may have had a beneficial effect, as the Sudanese Nubian population apparently wasn't prone to infectious diseases (based on records from the time) and the bones recovered from the Dakhleh Oasis didn't show any signs of infection (e.g. bone destruction due to leprosy).